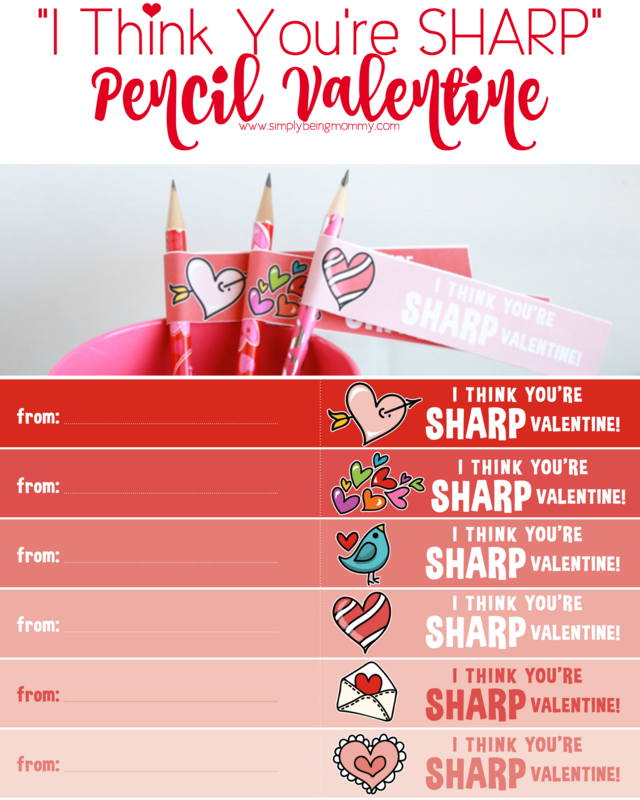 If you don’t want to send your child to school this year with candy on Valentine’s Day, this I Think You’re Sharp Pencil Valentine is such a cute alternative. Every year I try to think of ways NOT to send candy to school on Valentine’s Day. Sure, the kids love it, but the teachers and parents, well that’s another story. 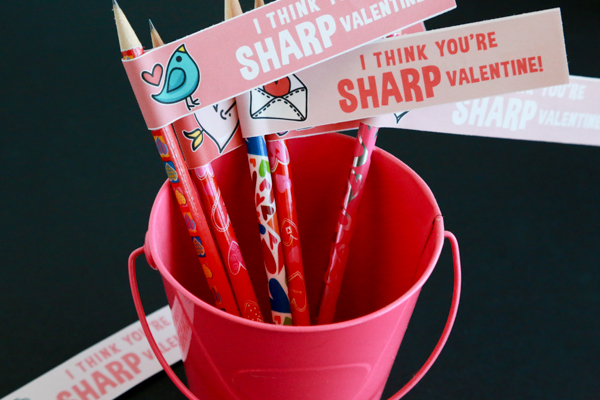 A couple years ago I sent these cute Easy Valentine’s Day Bubble Favors and this year we’re sending every child with these I Think You’re Sharp Pencil Valentines. 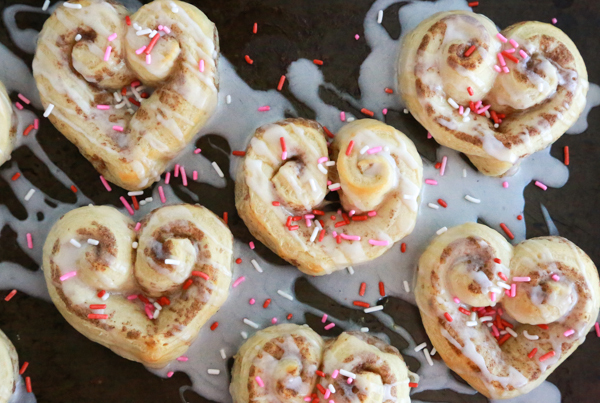 I love the way these turned out and I think they’re perfect for class valentine’s! 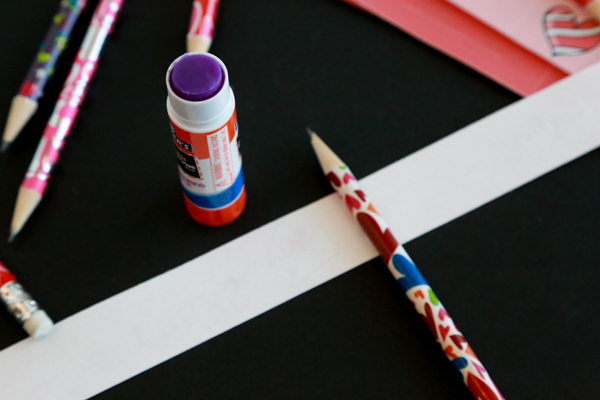 All you need is this free printable, themed pencils, and glue! Super simple, yet adorable. Because I know that life is busy and we don’t have many extra hours (if any) left over at the end of the day, I wanted to make something that was quick and easy for us to assemble. 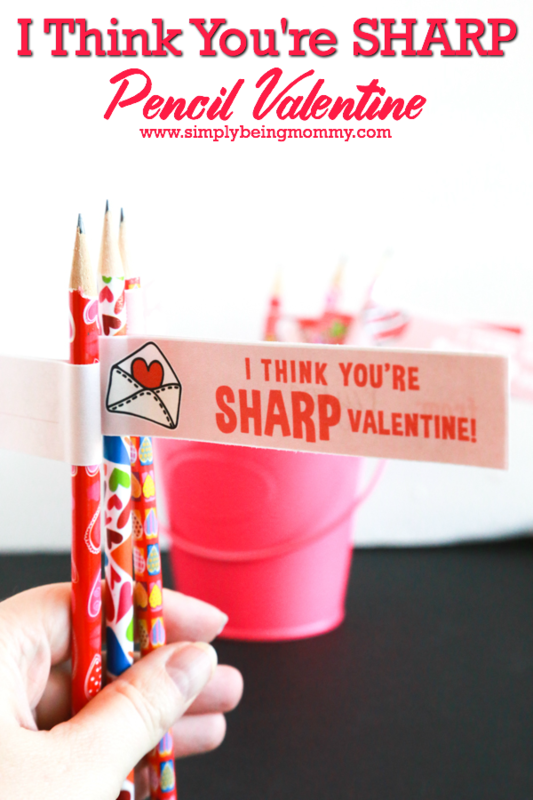 Here’s a simple step-by-step for making a I Think You’re Sharp Pencil Valentine. Print the free printable and cut using scissors or a paper trimmer. Each sheet has seven tags. To make it easy to find the middle, each tag has a dotted line. Lightly fold on the dotted line so that you know where the middle is when looking at the tag from the back. 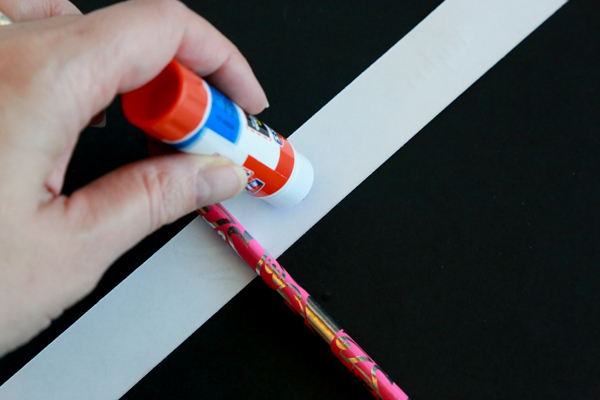 Using a glue stick or adhesive of your choice, apply to one side of the crease on the paper. I laid the pencil down on the tag to know where to stop applying the adhesive at first, but quickly changed to the creasing the paper method. Generously apply the adhesive on the entire side of the crease. 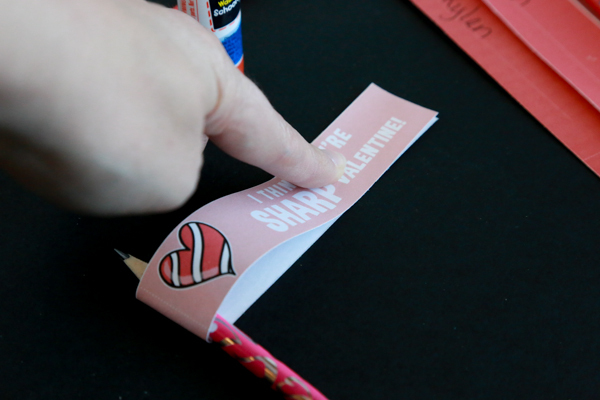 Then fold the tag over the pencil, end to end, and make sure it is wrapped firmly around the pencil. If you don’t have it tight enough, the tag will slide up and down the pencil. 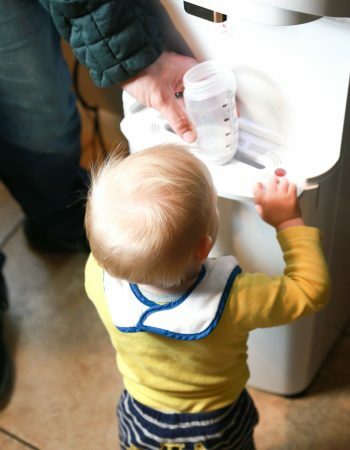 Hold it firmly for a few seconds to allow the adhesive to set and you’re done! So simple, right? 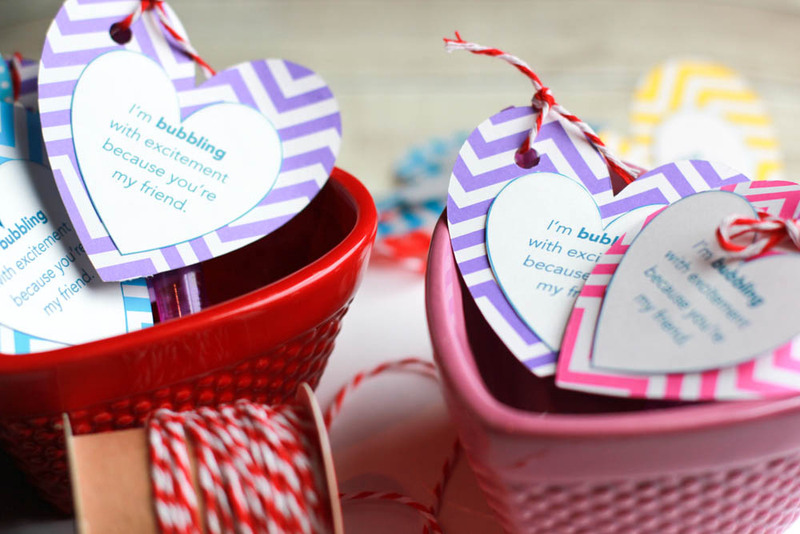 The free printable contains 7 different tags of varying colors, all in the pink and red hue. I’ve found that I get the best color when printing on the best possible setting in the printer properties. I’ve found that I can usually find a pack of 10 themed pencils in the Dollar Spot at Target! With the free printable and the super cheap pencils, I think we’re going to get off fairly cheap this Valentine’s Day! And since kids seem to go through pencils quickly, it will be a useful gift for your child’s classmates. Here’s to a Happy Valentine’s Day, y’all! 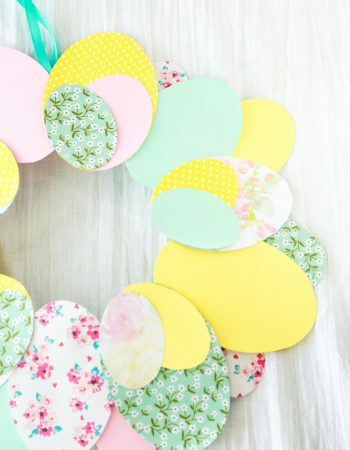 Such a cute and simple Valentine’s Day craft/gift! Thanks for sharing it! 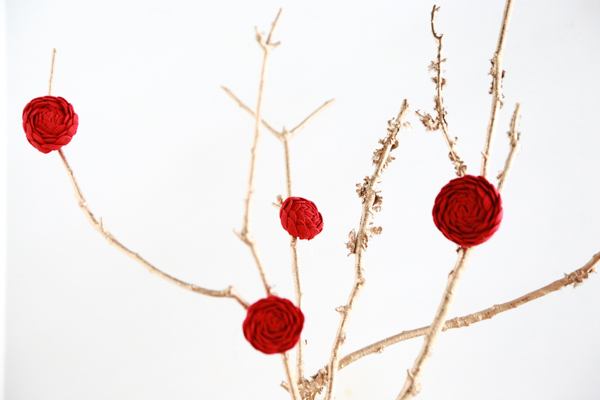 Very cute Valentine’s craft! 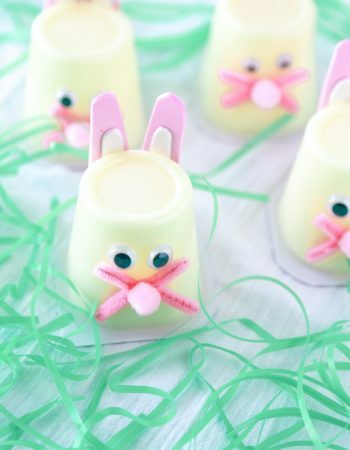 Simple for the kids to make, and better than candy!! That is the cutest little Valentine ever for a kid. I love everything about it, especially those cute little flags. What a super cute Valentine! It’s a great non-food option, which is nice. Fatalistic! Thanks so much for including a printable. 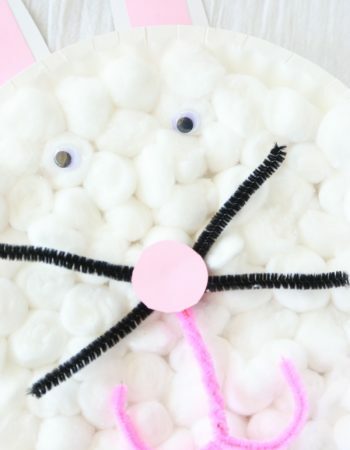 I’m making these for both kid’s classes! That is a great Valentine idea. I like cool ideas to do instead of candy. I agree! Especially with so many kids having food allergies these days! This is such a great idea. I love the cute gift tags. These are great for school Valentines. I think these are cute tags. What a creative idea here. These tags are simply adorable! Even though my kids don’t pass out at school any more, I may print them and put them in their lunches for a special treat on Valentine’s Day. I love this idea. My daughter has a few friends with diabetes and a few years ago I stopped sending candy and always did some sort of non candy. 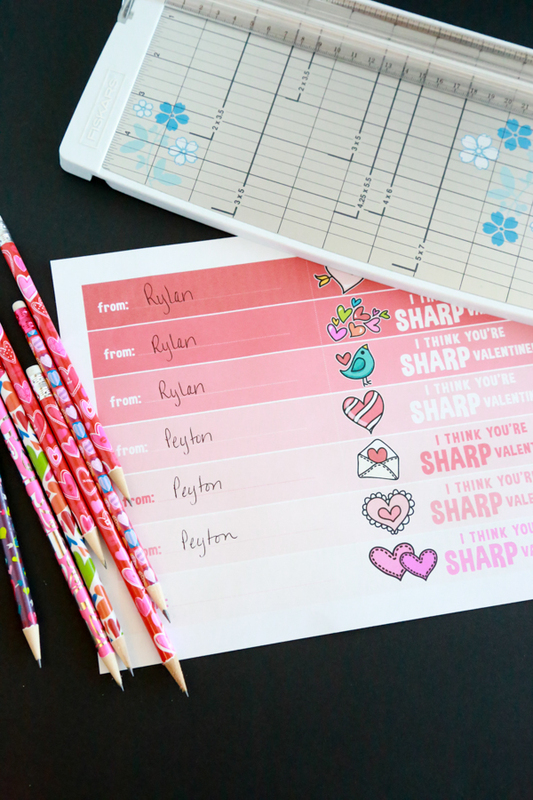 This is great because kids love pencils and I love your printable! CUTE! I love little Valentines’ prizes that are not candy. I need to get hopping for my son’s classroom! Me too! I always appreciate them because the candy ones are plentiful enough! These are super adorable, I just pinned and shared on my FB. 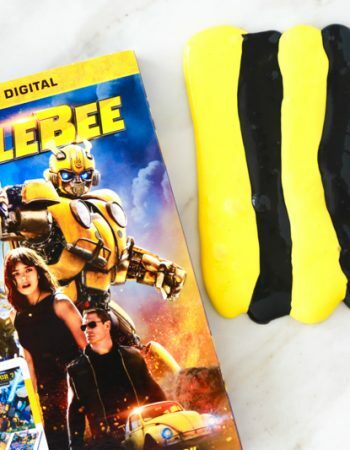 I must make them for the kiddos! What a really great idea! The last thing teachers (or parents) need is a kid with excess sugar in them. Those pencils are sure to be well received-they are really pretty! What a fabulous idea. This is way too cute, and I think my kiddos classes would love stuff like this. Esepcially the kinder and grade 1s! So cute. And pencils are on sale at Walmart right now! This is so much better than those silly sticker packs they sell. Isn’t this a fun idea! 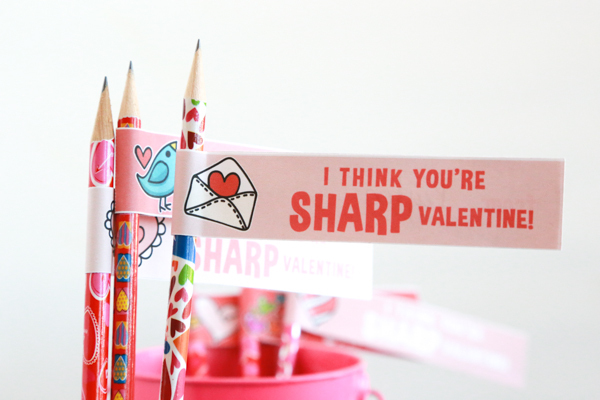 There are some cute Valentine’s pencils too. This would be a fun Valentine for school. After a major dental bill for our son’s filling, I’m hesitant to give other kids candy as gifts too. I can see us doing this simple craft! This is such a great idea. 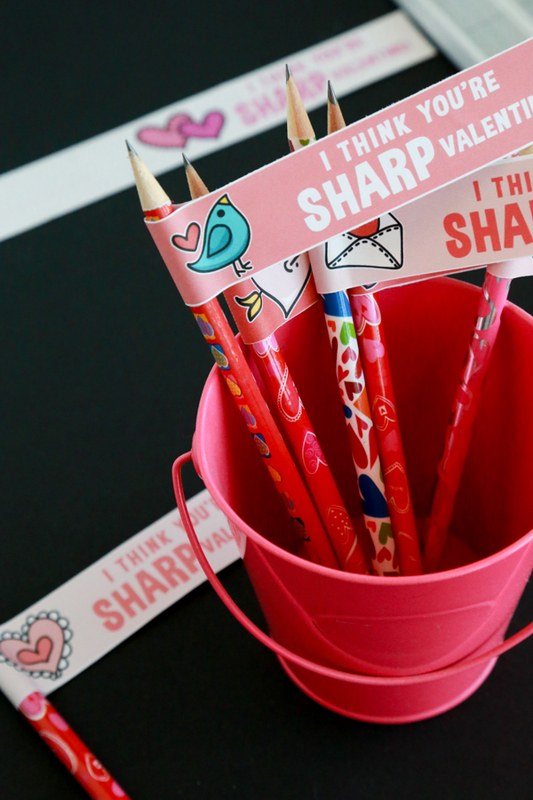 I like the idea of giving a pencil instead of candy and I love the printable. Isn’t that the cutest thing! I love these! So cute. Oh my gosh these are so cute!! My son and daughter would really love these! 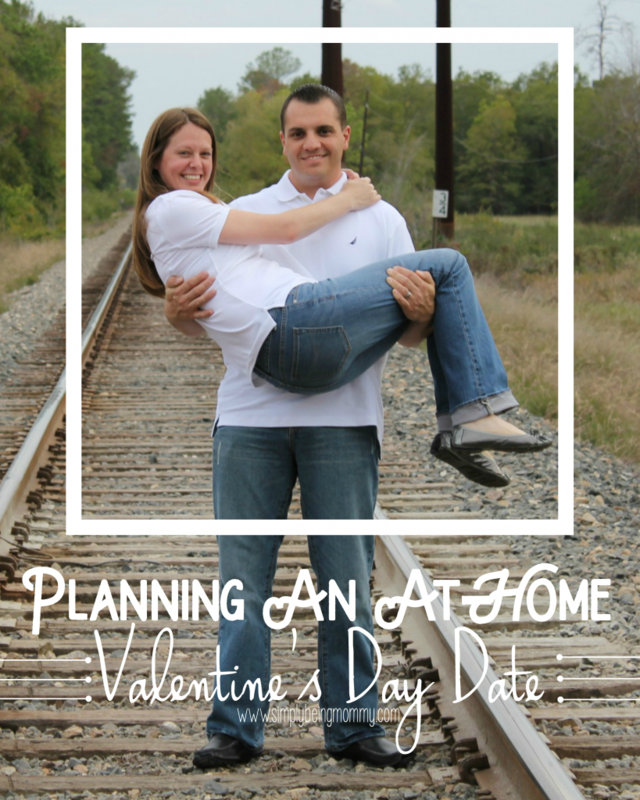 I love this Valentine’s Day idea so much and it offers a much needed break from the candy and sweets too. Thanks so much for the printable! These turned out super cute! Not a ton of work for them, either, which I appreciate since we have to get Valentines ready for three classes! These are so adorable! We are doing pencils this year too! 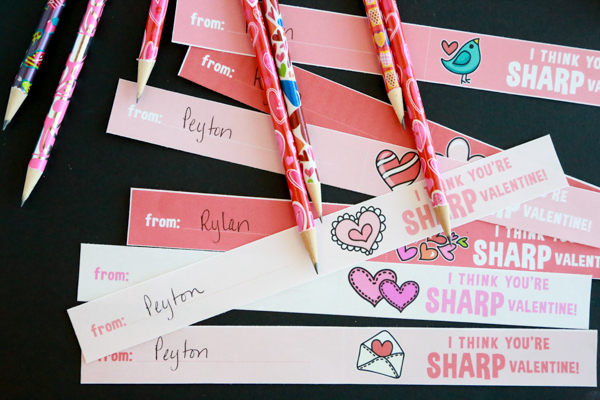 This is such an adorable Valentine idea, and it’s also super cost effective. I like that most anyone could put this together and do something really cute. Plus, what kid couldn’t use a pencil?